Naomi Feinstein has a clinically depressed mother, a very caring idealistic father who teaches Naomi life lessons at every opportunity—and an eidetic memory that at times does her more harm than good. Without her mother’s companionship, Naomi spends much of her time with her dad who loves to take her on excursions to the home of Rose Kennedy to walk the rooms, contemplating what Rose’s life was like or could have been. During one such trip, Naomi’s father has a heart attack, and though he recovers, she is deeply affected. The event elicits a proclamation that she will become a cardiologist—if only to fix the people she loves and prevent their leaving her. Treated as an outsider at school, Naomi is virtually friendless until Teddy moves in next door. Finally having someone her own age to spend time with and confide in brings Naomi some peace. As they mature, so do their thoughts and feelings, until their mid teens when Teddy is whisked away after the death of his father. The loss of Teddy is something Naomi neither understands nor recovers from. Distracting herself with thoughts of attending Wellesley College—the very college that Rose Kennedy regretted not attending—her dream is realized with an acceptance letter. Naomi is glad to have her dreary high school days behind her and looks forward to the new life college will provide. But she soon learns that changing your life requires much more than simply changing your location. Elizabeth Percer expertly renders characters who seem like basic every day people, but possess a fair amount of depth and complication. Naomi’s father is a very wise, proud, and caring man, with a maternal way about him that neither lessens his masculinity nor Naomi’s craving for her mother’s attention. It quickly becomes clear that without his guidance, she would have little direction; yet at the same time Naomi serves as a buoy to which her father clings, staving off his own feelings of loneliness. Though her father wants nothing less than to see his daughter happy, he finds it difficult to let go and give her the room to soar on her own—a fact not lost on Naomi—and upon watching him walk away after dropping her off at Wellesley she observes, “He is a man that never understood goodbye.” But even when her father loosens his hold—if only seemingly—Naomi’s timid disposition often leaves her frozen in place, fearing change. Having set such high goals for herself, boosted by her father’s hopes for her, Naomi always seems weighed down by an innate sadness, pining for something she can’t quite put her finger on; however, shouldering the burden of loss is nothing new to her, having suffered the loss of her only childhood friend and first kiss, and yearning for a mother who hides behind a perpetually closed bedroom door. It’s as if Naomi is taunted by the love and opportunity she seeks: The doors appear easily accessible, yet they are unceasingly impenetrable. Elizabeth Percer relates the life story of Naomi Feinstein with beautifully scripted, lush prose drawing in the reader and providing an unobstructed view deep into the hearts of her characters. An Uncommon Education will no doubt resonate in some way with every person who reads it. 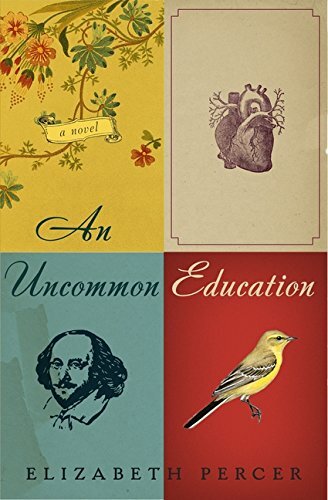 Despite its categorization as Elizabeth Percer’s debut, An Uncommon Education is rich in history, steeped in family tradition, and full of emotion—a lesson in practiced elegance.